That is the King James translation of the sixth commandment. It is a magnificent translation. But this one has led to much moral confusion. You would think that of all the Ten Commandments the one that needs the least explaining is the sixth, because it seems so clear. It is the one that the King James Bible, the most widely used English translation of the Bible, translates as, "Thou shall not kill." Yet, the truth is the quite the opposite. 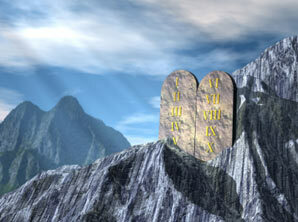 This is probably the least well understood of the Ten Commandments. The reason is that the Hebrew original does not say, "Do not kill." It says, "Do not murder." Both Hebrew and English have two words for taking a life  one is "kill" (harag, in Hebrew) and the other is "murder" (ratzach in Hebrew). 1) Taking any life  whether of a human being or an animal. 2) Taking a human life deliberately or by accident. 3) Taking a human life legally or illegally, morally or immorally. On the other hand, murder can only mean one thing: The illegal or immoral taking of a human life. That's why we say, "I killed a mosquito," not, "I murdered a mosquito." And that's why we would say that "the worker was accidentally killed," not that "the worker was accidentally murdered." So why did the King James translation of the Bible use the word "kill" rather than "murder"? Because 400 years ago, when the translation was made, "kill" was synonymous with "murder." As a result, some people don't realize that English has changed since 1610 and therefore think that the Ten Commandments prohibits all killing. But, of course, it doesn't. If the Ten Commandments forbade killing, we would all have to be vegetarians, as killing animals would be prohibited. And we would all have to be pacifists  since we could not kill even in self-defense. However, you don't have to know how the English language has evolved to understand that the Ten Commandments could not have prohibited all killing. The very same part of the Bible that contains the Ten Commandments  the Five Books of Moses, the Torah as it is known by Jews  commands the death penalty for murder, allows killing in war, prescribes animal sacrifice and allows eating meat. A correct understanding of the commandment against murder is crucial because, while virtually every modern translation correctly translates the commandment as "Do not murder," many people cite the King James translation to justify two positions that have no biblical basis: opposition to capital punishment and pacifism. Regarding capital punishment and the Bible, the only law that appears in each one of the Five Books of Moses is that murderers be put to death. Opponents of the death penalty are free to hold the view that all murderers should be allowed to live. But they are not free to cite the Bible to support their view. Yet, many do. And they always cite the Commandment, "Do not kill." But that, as should now be abundantly clear, is not what the commandment says, and it is therefore an invalid argument. But it is dishonest to cite the commandment against murder to justify pacifism. There is moral killing  most obviously when done in self-defense against an aggressor  and there is immoral killing. And the word for that is "murder." The first one on that list is "Do not murder." Why? Because murder is the worst act a person can commit. The other four commandments  prohibiting stealing, adultery, giving false testimony and coveting, are all serious offenses. But murder leads the list because deliberately taking the life of an innocent person is the most terrible thing we can do. That is why it is so important to understand that the commandment prohibits murder, not all killing. When people liken killing in self-defense to murder  such as when they equate killing the terrorist who is murdering people with the murders that the terrorist is committing  all they are doing is reducing the evil that murder is. And when they use the Ten Commandments to justify that position, all they are doing is making the Ten Commandments, the moral foundation of Western Civilization, morally irrelevant. The next time you hear someone cite, "Do not kill" when quoting the sixth commandment, gently but firmly explain that it actually says, "Do not murder."